Since 1992, Video Essentials have been VHS to digital video conversion specialists, providing a comprehensive service in VHS, VCR & camcorder video tapes to digital conversions and duplication. You can expect prompt and reliable services at the best prices. Only top quality Verbatim discs are used. As a home-based studio, Video Essentials can offer 24/7 services. You can drop off videos and films in the evenings and weekends. Likewise, you can email digital content any time. Urgent jobs can be turned around overnight if need be. Slideshows for funerals are guaranteed ready the next day. 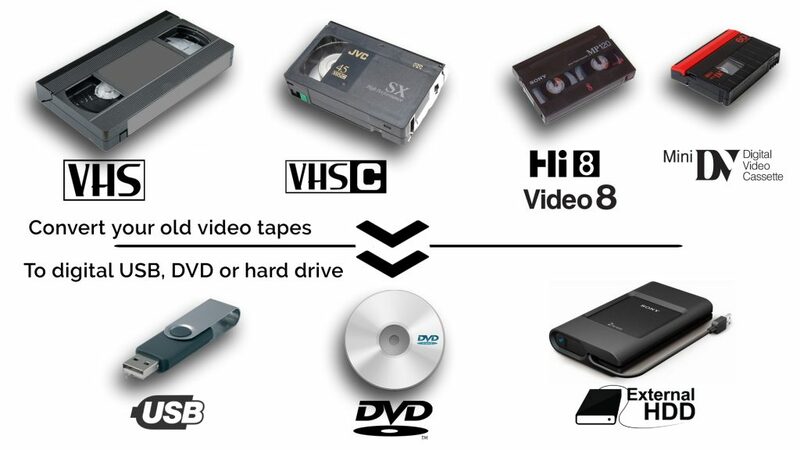 When you convert your video tapes to digital USB or Hard Drive, you can watch your family memories again on your Smart TV, computer, smartphone or iPad/tablet. It is now easy to share and preserve your memories with family and friends by simply copying your MP4 files, or you can edit your videos on your computer. Transferring your VHS video tapes to digital DVD means you can watch your videos on any Australian DVD player. We convert VHS, VHS-C, Video 8, Hi 8, Digital 8, Mini DV and DVCam to DVD. All DVDs come with professionally printed titles and a plastic protective case. Many people today love the convenience of playing video files on their devices. Using state-of-the-art technology, Video Essentials can convert VHS, VHS-C, Video 8, Hi 8, Digital 8, Mini DV and DVcam to MPEG4, and deliver on USB and portable hard drive. There are many types of MPEG4. We convert to H.264 which is the industry standard and native to Apple devices. It plays on your PC and Mac. Image quality is better and playback is more fluent than with basic MPEG4 compression. The cost of conversion from a single video source is $20 for the first hour and an additional $10 for each subsequent hour. Completed files can be transferred to your portable hard drive or to a USB stick. Even though DVDs are high quality and convenient to use, many customers are telling us they no longer have DVD players. Video Essentials can extract files from DVDs and convert them to MPEG4 (H.264) files for playback on your digital devices. The cost for copying these files is a flat $20 (incl GST) per DVD. All duplicated CDs and DVDs are supplied with professional labelling and protective plastic cases on Verbatim DVD-R discs. We guarantee a quick turnaround. We provide VHS tape to DVD digital conversion service throughout all areas of Melbourne, specialising in the Bayside area. Based in Sandringham, we cover all Bayside suburbs, including Sandringham, Hampton, Brighton, St Kilda, Hightett, Black Rock, Beaumaris and Mentone areas.